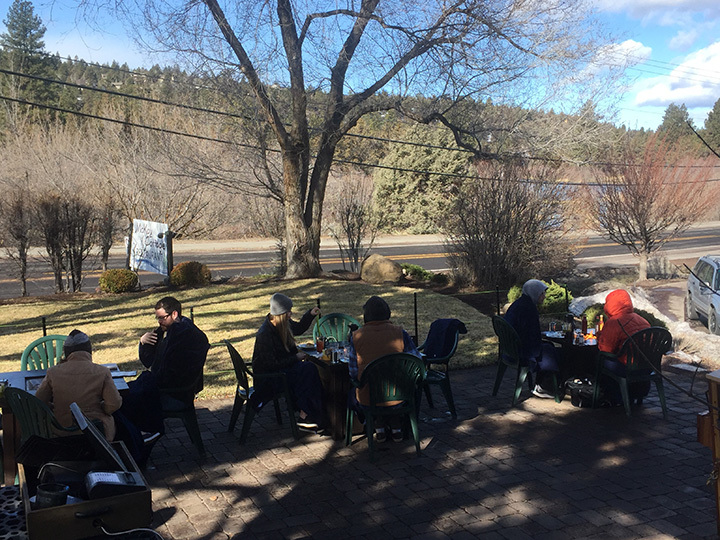 Outdoor dining in Bend is as common as craft beer, golden retrievers, puffy jackets, and Subarus loaded with bike gear. In other words, no Bend vacation is complete without a few of those things. While patio dining with a river views is a hallmark of summer, and noshing next to a fire pit is a quintessential winter experience, what about those in-between times when the weather is less-than-ideal? No worries! Here are 5 places you can eat outdoors even when the weather outside is frightful. 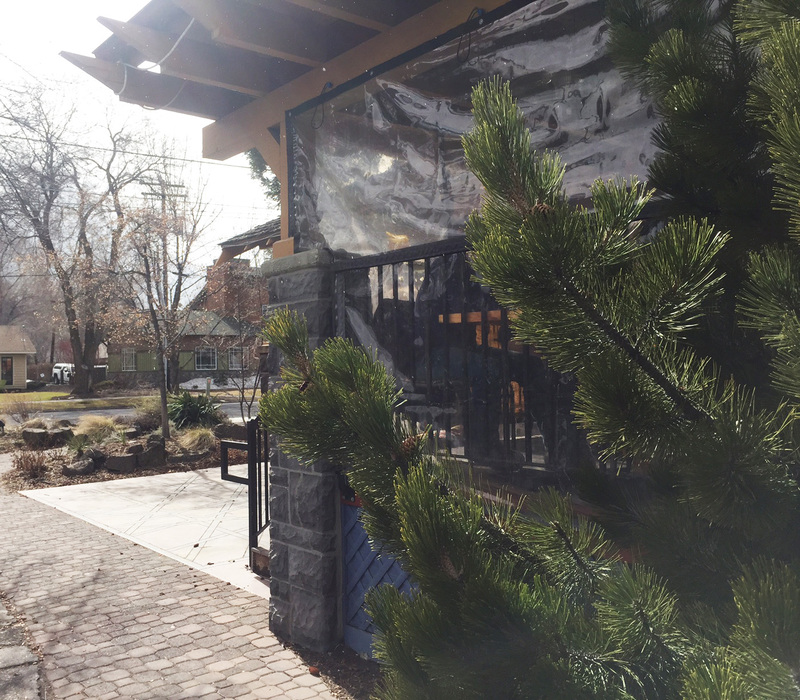 One of Bend’s most popular breakfast spots, McKay Cottage is famous for its scrumptious hashes, delectable croissant-style French toast, and melt-in-your-mouth bacon. Snuggle up in a blanket with a mini fire pit in the center of your table at McKay Cottage. The aforementioned popularity means wait times on weekend mornings can be long, especially in mid-summer when everyone’s jockeying for spots in their sunny outdoor courtyard. But in fall, winter, and spring when temps are chilly and outdoor dining isn’t at the top of most folks’ to-do list, you can skate right to the front of the waiting list by requesting one of those patio tables. The tables boast gas fire pits in the center, and your server will cheerfully bring you a stash of blankets to help ward off the chill. Bundled up in your blankie, you can order tasty belly-warming favorites like the Hoodoo Hash made with golden-brown sweet potatoes, all-natural prime beef brisket, caramelized onions, roasted peppers, Grafton Village smoked cheddar, poached eggs, and house-made hollandaise. It’s served with a homemade butter scone and fresh fruit and is huge enough to split or to package up for leftovers the next day. It’s a fact that craft beer tastes better outdoors, and few pleasures rival the experience of sipping a pint next to a fire pit at your favorite stop on the Bend Ale Trail. Have you ever eaten dinner inside a covered bridge? You can do it at Sunriver Brewing’s Galveston Pub. 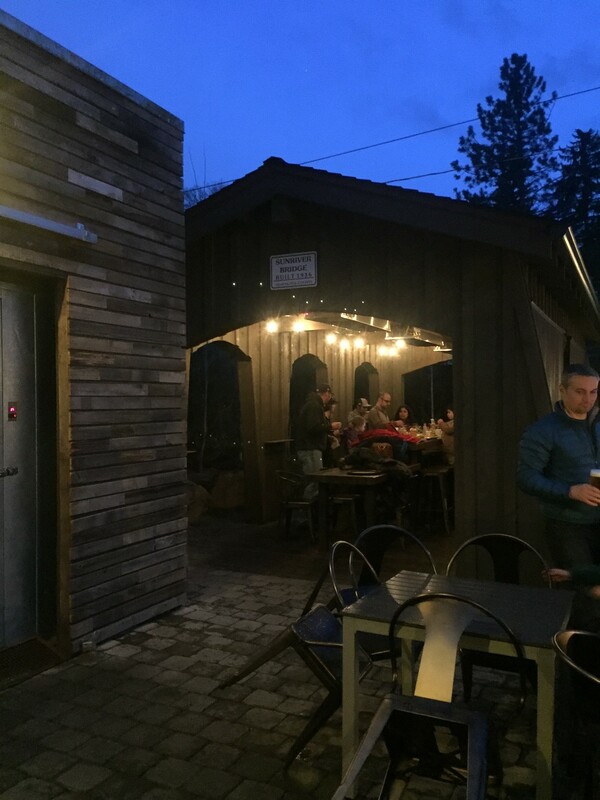 But for a truly unique outdoor dining experience at a brewery, check out the Sunriver Brewing Company’s Galveston Pub in Bend. Their indoor space has an industrial vibe and garage doors that open up in summer, while the outdoor space has a fab fire pit to keep you toasty. But best of all is what’s adjacent to that fire pit. It’s an incredible replica of the Shevlin Covered Bridge, with a spacious row of tables inside. The space is kept toasty warm with heat lamps, and open to the elements on either end. Bonus: On chilly nights, there’s usually a shorter wait-time for spots inside the bridge than there is for an indoor table. Double-Bonus: The kids’ menu here is one of my faves, with entrees like mini hand-dipped corndogs, pulled pork sliders, mac & cheese, chicken strips, and more. Each comes with your choice from a list of sides that includes fresh fruit or cold veggies with ranch dip (a great way to make sure the young’uns are eating healthy). Triple-Bonus: Pineapple poppers made with pepper bacon-wrapped pineapple, queso fresco, jalapeños, and burgundy reduction. Need I say more? 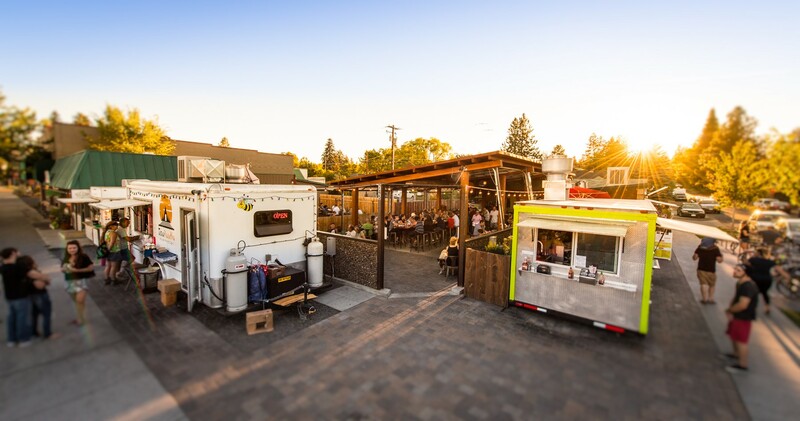 For the crème de la crème of outdoor dining in Bend, look no further than The Lot. So many tasty (and cozy!) dining options at The Lot. This one-of-a-kind eatery offers a unique spin on the food cart pods you find in many cities. A cluster of culinary trailers surrounds an open-air seating area with built-in tables, heated seats, and overhead heaters that keep the space nice and toasty. There’s a bar with 16 tap handles, and plenty of space for families, dogs, or a group of pals to hang out. They’re open seven days a week, rain or shine, and can keep you toasty even on the chilliest days. The food carts themselves offer a huge variety to choose from. A La Carte is my personal fave, with unique creations like their gorgonzola bacon fries, a mouthwatering array of tacos, and their famous mint lemonade. The winter months bring out their scrumptious lemongrass and coconut milk clam chowder, which is TO DIE FOR. As I said before, many of the stops on the Bend Ale Trail have fire pits, but the one at 10 Barrel takes the prize for size and flexible seating. 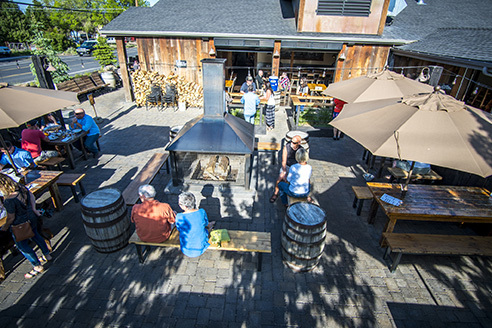 The massive fire pit is the centerpiece of the courtyard at 10 Barrel. You can fit a buttload of beer drinkers around it without feeling too crowded or giving up privacy. I’ve enjoyed countless romantic beer outings here with my hubby on the wide bench seats that allow us to snuggle up and tune out the other people around us. Of course, if you feel like being social, it’s also a good place to chat up your fellow travelers or locals coming down from a long day on the slopes. There’s room enough for everyone! Tip: Study the menu closely for their awesome suggestions on which beers pair best with each dish. Also, their pizzas here are OUTSTANDING. Okay, so what if it’s really lousy outside? Like snowing sideways with winds gusting hard enough to make even semi-open-air dining impossible. The outside of Kebaba’s enclosed sun porch. What you really need is a way to dine in a clear plastic bubble, complete with heat lamps, heated benches, and beautiful views of the outdoors. But where would you find such a thing? 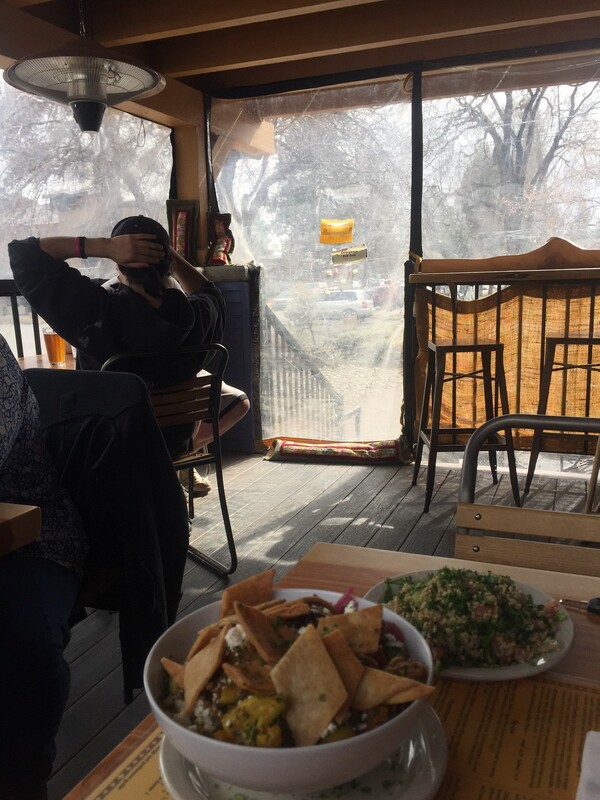 This charming little Middle Eastern bistro features mouthwatering kebabs, babaganoush, gyros, schwarmas, and hands-down the best hummus I’ve ever eaten (seriously—I don’t even like most hummus, but I once drove across town in a snowstorm at rush hour just to get my hands on theirs). Tasty lunch from inside the Kebaba bubble. But back to the plastic bubble. The whole restaurant is situated in a charming craftsman bungalow, and the bubble is essentially a sun porch screened in with clear plastic panels. You still get the charm of outdoor dining and views of their pretty courtyard, but you stay nice and toasty and dry. My favorite dish here is the karnabeet, which is a cauliflower dish that’s simply out-of-this-world. Their lunch plates are affordable and flavorful, or come for dinner and scope out plastic bubble dining with the magic of twinkle lights around you.